Exam Stress is a very normal part of the lead up to the Junior and Leaving Cert. Stress is often caused by your feelings of having a lack of control. What if I do badly? What if I can’t answer all the questions? What if I draw a blank? A build up of too much stress can lead to anxiety and poor exam performance. 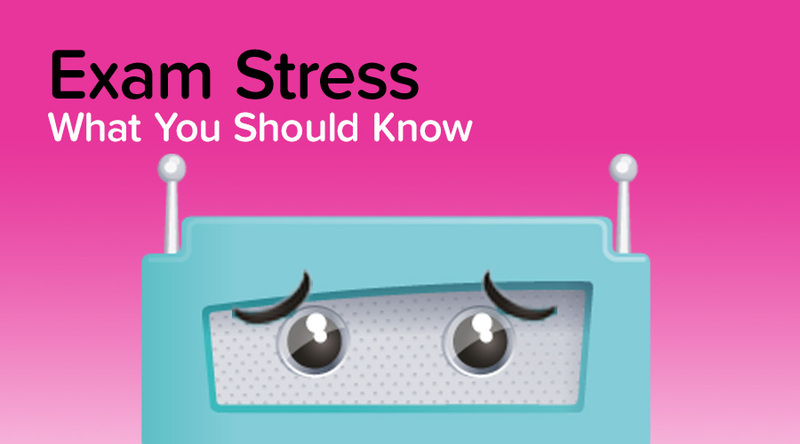 Check out these things you should know about dealing with exam stress. The human brain and body can actually work better when put under some stress. That’s what adrenaline is for. It 's completely normal to feel some stress before exams. It only becomes a problem if that stress is severe over a prolonged period. Prolonged stress often effects your body in the form of headaches, backaches, tummy pains and often difficulty in sleeping. It will often show in your emotional well-being with you becoming more irritable, anxious and even angry at friends and family. It’s important to look out for these symptoms of stress before taking steps to control your stress. In most schools, classes finish in late May leaving you up to 10 days to study on your own. Any exam stress you have at this time will be heightened with the isolation of studying alone. It’s likely that all your class mates are experiencing similar feelings so make sure to talk regularly with them to remind yourself that you are not alone. Even better, organise a study group where you teach each other some of the more difficult parts of the course. Check out these tips for studying at home. Stress is caused by a lack of control. Making a good study plan is a really good way of making you feel like you are in control again. Don’t pack too much in to the plan as you'll never get it all done. You can get a printable timetable here. Caffeine, energy drinks or even cigarettes are best avoided. Even though they may help you study late into the night it is likely that they will disturb your sleep cycle. Remember the exams start at 9:30 each morning so make sure your body clock is still in sync with a normal school day. One of the main symptoms of heightened stress is lack of sleep. It’s very common to experience difficulty sleeping in the lead up to the exams. Just try and get into a regular routine so that your body knows when it’s time to sleep. Try to avoid studying in bed and switch off your phone but don’t forget to set the alarm! Being familiar with the layout of the paper is a really important first step. While you can’t predict exactly what will be asked knowing the structure of the paper will at least give you some sense of control. Remember that if a difficult question comes up it is likely that all students will be finding it difficult. While you can never fully eliminate exam stress, understanding your symptoms and how to handle them can help you a lot. You’ll find loads more great information on our discussion board.